is situated in Higher Blackley, bordered to the east by Blackley Cemetery and Crematorium, the west by the River Irk, the north by Victoria Avenue and the South by Blackley New Road. Click here for a more detailed walking map showing three different pathways graded for easy, moderate or hard walking. Please feel free to print the map to take with you whilst walking in the forest. Blackley Forest is ideal for outdoor recreation. Walking, fishing and bird watching are just a few of the activities you can enjoy. 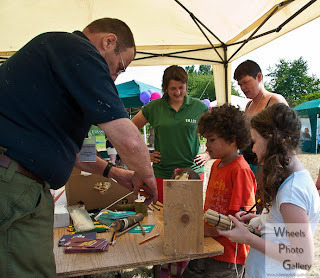 Making bird boxes at the Blackley Forest Fun Day.